About Schmidt opens with a long take of Warren Schmidt (Jack Nicholson) sitting in a nondescript box of an office in Omaha, Nebraska, a stack of cartons piled up waiting for the movers, the clock ticking away. Not until the stroke of 5:00 will Schmidt leave the office on the last day of his career as he enters retirement; until the last moment he plays the game. Schmidt has been an actuary–in the public image perhaps the only profession grayer, duller than accounting–and his retirement sets off an inner journey of reexamination and self-discovery. For a population whose demographics contain an ever larger percentage of older people, the retirement crisis may be replacing the midlife crisis as a subject of prime interest. It’s a subject worth exploring. What Schmidt finds, over the course of better than two hours of film, is that his marriage of 42 years is more full of resentment and petty annoyances than it is of pleasure; that his best friend betrayed him; that as soon as he left the office, it was clear he was expendable. His daughter, Jeannie (Hope Davis), lives in Denver and is about to marry Randall (Dermot Mulroney), a sweet, well-meaning airhead. When Schmidt repeatedly discourages Jeannie from this match, he learns of her resentment towards him: “All of a sudden you’re taking an interest in me? After all these years?” What had appeared on the surface to be a life of middle-class comfort and satisfaction turns out to be an empty shell of failed ambitions and hollow relationships. Before Schmidt’s wife, Helen (June Squibb), suddenly dies, she serves him breakfast in their new Winnebago, expressing platitudes of anticipation of their “whole new life” together. Even at that early stage, writer/director Alexander Payne (Election) has made it clear that there will be no “whole new life.” At home or in the Winnebago these folks will carry the baggage of a lifetime with them. 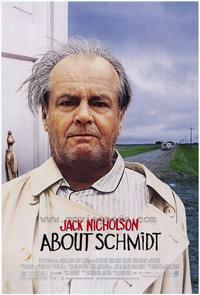 After Helen dies, Schmidt sets off in the Winnebago on his own and the inner journey morphs into a road film. Payne has an unerring eye for the satirical target and throughout the film he gets some laughs as he jabs at people’s foolishness, pretensions, and self-deceptions. In particular he deals with rites of passage–the retirement dinner, the funeral, the wedding–and savages the superficiality of the sentiments expressed and the banality of the rituals enacted. When the core theme seems to run a little short of steam, he digresses into Randall’s family, particularly his mother (Kathy Bates), who is a self-absorbed divorcee immersed in a New Age culture that seems a good three decades out of date. Bates, as usual, creates a quirky and funny portrait, but in the overall structure of the film it seems out of balance; Payne goes for the laughs here and they are a welcome relief, but much of the Denver sequence seems ancillary to the point of the film. In response to a television appeal, Schmidt contributes to an “adopt a child” program; for his monthly check, he is invited to write to a six-year-old Tanzanian boy and is promised a letter in return. In his isolation, Schmidt’s only avenue of expression of his current feelings is in the writing of these letters to Ndugu. It’s absurd, of course, but funny–the first time. Payne uses Schmidt’s voiceover text of the letters repeatedly and it loses its effectiveness quickly. In Election, too, Payne overused the voiceover. While the technique has its place, it is almost by definition anti-filmic; the essence of good filmmaking is to have the onscreen visuals and dialogue carry the thread. In film, being read to is a weak substitute for being shown. Nicholson, whose performance here is one of the most hyped in years, is very good, indeed. As advertised, he’s toned down the Nicholson screen persona and comes up with a performance of sensitivity and depth. Even his walk is calculated to reflect the pinched personality of a bureaucrat who is a defeated man. He makes Payne’s film look better than it is, but he can’t save it from being overlong, repetitious, and flat. Beyond Schmidt’s crisis, Payne is most interested here in the banalities of ordinary lives and self-deceptions. Banality as a subject is risky–a little goes a long way and in About Schmidt Payne submerges the audience in it. As in Election, too, Payne doesn’t have much flair for the look of the images on the screen. The cinematography is dull, the images flat. There’s no visual energy on the screen. And, in another case of the ongoing epidemic of self-indulgent direction, many scenes are drawn out far longer than their content justifies. It’s as if once the director has committed a scene to celluloid, he cannot bear to leave a single moment of his creativity on the cutting room floor. For all too much of its length, About Schmidt is as tiresome as the sharing of family photograph albums by strangers–a practice that Payne mocks in the film.